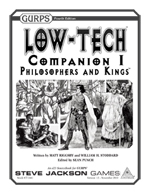 GURPS Low-Tech Companion 2: Weapons and Warriors contains martial-minded information that rulers can use to keep their kingdoms safe – or to expand their kingdoms at the expense of their neighbors. 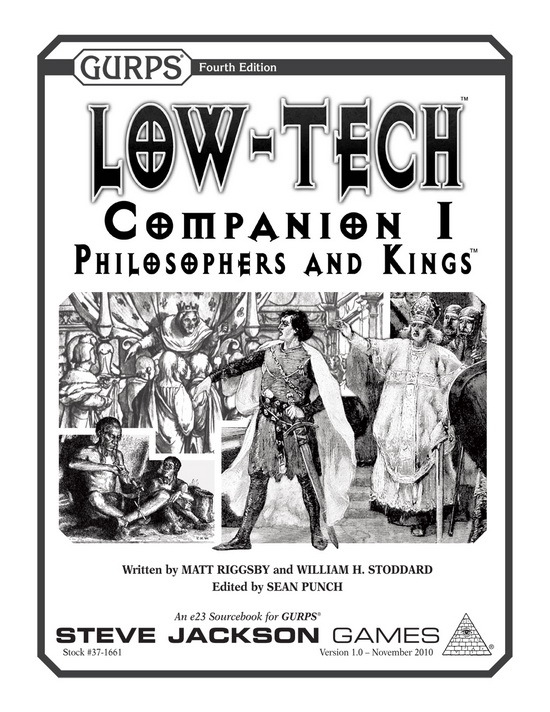 With GURPS Low-Tech Companion 3: Daily Life and Economics, you can bring life to your low-tech settings by detailing the everyday activities that make the world run. For an alternate (fantastic) take on alchemy, plus low-tech "computers" that might have been developed on alternate worlds, check out GURPS Fantasy-Tech 1: The Edge of Reality. GURPS City Stats provides a system to define the areas that regional leaders rule over. For an ambitious project suitable for any king, visit the majestic Gothic spires of GURPS Locations: St. George's Cathedral. To learn about one of the most interesting and successful cities of the TL4 world, visit GURPS Hot Spots: Renaissance Florence. Get more info on musical instruments – plus info for how to use them as magical items – in "Instruments of Enchantment" from Pyramid #3/82: Magical Creations!